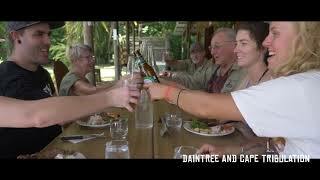 Join Billy Tea Safaris on one of the many personalised tours available including World Heritage listed Daintree/Cape Tribulation and also Chillagoe Caves and Outback. You will retrace the footsteps of some of Australia's earlier explorers and see wonderful diversity of scenery from ancient rainforest, Savannah plains, Giant Magnetic Termite Mounds, pristine beaches and reefs as well as the wetlands to view wallabies, emus and other wildlife. Birdlife is plentiful on the wetlands. Spot rare animals like a Cassowary or a Boyd's Dragon. Enjoy an Aussie barbecue lunch. Drinks at passenger's own expense. Try a traditional Aussie 'Billy Tea' with damper. Spend time at the famous Cape Tribulation Beach - the only place in the world where two World Heritage listed areas meet.